The promise to rescind Australia's carbon tax is causing some conservatives to throw bouquets, but climate advocates are downplaying the impact that the federal election Down Under might have on American efforts to price emissions. Prime Minister-elect Tony Abbott, of the conservative Liberal Party, made the nation's 1-year-old carbon tax a key theme in his campaign against incumbent Kevin Rudd, whose Labor Party elevated climate change to the peak of public policy as natural disasters whiplashed the nation between drought and flood in recent years. And he sparked strong opposition along the way. Days before the Saturday election, Abbott described the race as a broad test of the tax's popularity in a country whose rich coal seams are threaded throughout its economy. Australia exports the most industrial-use coal in the world, much of it to China, though that fuel is not taxed for emissions. Tony Abbott, prime minister-elect of Australia. Photo by Troy Constable, courtesy of Wikipedia. American conservative groups echoed Abbott, warning that the race's result in Australia foreshadows election dangers for a Democratic Party that holds climate policies high on its list of objectives in the United States. To that end, a group of Democrats in the Senate and the House is asking companies for their help in fashioning a carbon tax that could be used to lower other types of taxes paid by businesses, but a legislative proposal remains elusive. Abbott's victory "doesn't help" the American effort to construct a carbon tax, said Rep. Earl Blumenauer (D-Ore.), a co-chairman of the Bicameral Task Force on Climate Change. But he disputed the idea embraced by energy groups aligned with Republicans that Australia's election was also a global vote against pricing greenhouse gases. "I don't think it's an international referendum on the carbon tax," Blumenauer said in an interview. The tax was among a buffet of topics that Australians considered when casting their vote. And though the climate policy was a pillar of Abbott's campaign, there were also others. Economic turbulence, an emotional immigration debate and the haphazard way in which the Labor Party ran the government all played into the outcome, according to analysts. For Blumenauer, that mix of distasteful political ingredients is a sign that the carbon tax remains "the simplest" way to address climate change. "I've had a hundred conversations with people in the corporate sector [about taxing carbon], and in every one of those conversations, the reaction has been from neutral to positive," he said. "Nobody says, 'This is a non-starter; this is a bad idea.'" It's also unclear whether U.S. lawmakers are tuned into the politics of a country half a world away. There are many cultural similarities between the United States and Australia, but the politics of the parliamentary system differs sharply. The election, as an example, was scheduled in January and then rescheduled in June. "I don't think this will have sort of a big impact on U.S. domestic politics," said Henrik Selin, a Boston University professor who studies international environmental politics. "And I don't think Washington cares all that much about what happens in Australia." He may be right. When Rep. Fred Upton (R-Mich.), chairman of the Energy and Commerce Committee, was asked this week about the outcome in Australia, he said, "I didn't see it." But others think the result in Australia reflects a "kick back" against U.S. policies that threaten to raise the cost of electricity. "Solar and wind and all the alternatives are not cost-effective, and so your base-line power is going to be natural gas and coal and maybe in some countries hydro and nuclear," said Rep. Joe Barton (R-Texas), chairman emeritus of the Energy Committee. "When you try to monetize that cost for political purposes or political correctness, voters -- whether they're Australian voters or United States voters, and I'm gonna guess in the very near future European voters -- are gonna kick back." Rep. Cory Gardner (R-Colo.), another committee member, said politicians who chase policies that hit people in the wallet are tempting voters to oust them. "I think it is very much a warning," Gardner said of the Australian election. But Australian climate activists contend Abbott's election was not a referendum on global warming action -- and, they argue, exit polling backs them up. Aussie carbon target still intact? The findings come from a weighted JWS Research national automated poll of more than 1,500 voters that found that jobs and the economy were far and away the top issues for Australian voters. Only 5 percent said climate change brought them to the polls, and just 3 percent were motivated by a desire to repeal the carbon tax. "If you follow the media narrative, leaders have stood or fallen on the carbon price. But this election wasn't a referendum on the tax, just very clever campaigning," said Anna Malos, director of Climate Action Network Australia. With record floods, droughts and forest fires, Australia is one of the nations most affected by climate change. 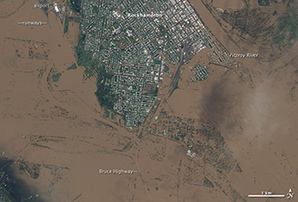 On Jan. 9, 2011, after days of rain, major parts of Rockhampton, Queensland, including its connecting highway and airport, were underwater. Now Queensland is pushing the new government to open new coal mines (see related story). Photo courtesy of NASA. She noted that well over half the country supports ratcheting down greenhouse gas emissions. Even Abbott's coalition government, she said, still supports the country's target of cutting carbon 5 percent by 2020. Meanwhile, the government last year vowed to join a second phase of the Kyoto Protocol, binding industrialized nations to emissions cuts, and the Abbott government has not backed away from that promise. "They need to be a bit careful there," Erwin Jackson, CEO of the Climate Institute in Sydney, said of U.S. and other opponents of climate action using Australia as a harbinger of carbon pricing doom. "Even in the final days of the election, the coalition maintained its support for Australia's emissions targets." Even business leaders who oppose the carbon tax say they still want climate action. The Investor Group on Climate Change, for example, praised efforts to repeal the tax, calling the move "good for the economy." But the group's chief executive, Nathan Fabian, also noted in a statement that "Australia is highly exposed to the worsening risks of climate change and needs to take action to reduce emissions at low cost." The clashing expectations mean all eyes will be on Australia in November, when U.N. climate change negotiators meet in Warsaw, Poland, for the next round of treaty negotiations. Without a carbon tax, analysts said, diplomats will be pressing Australia to explain how it plans to meet its emissions goals and propose new targets for a future global warming treaty starting in 2020. "I think what the international community will be looking for is a clear statement that Australia continues to be committed to implementing its current target and is in the process of figuring out how to do that, and that they are committed to working with the global community to put numbers on the table for the post-2020 time period," said Jennifer Morgan, director of the climate and energy program at the World Resources Institute think tank. "I don't think Australia can disappear into its own national debate alone," she added. "There will be international eyes on what they're doing. People will be looking to see if they are a responsible player or not." Jackson agreed. "If we don't have a policy that can deliver absolute, sustained and real emissions reductions, then there is a real risk Australia will go down the path of Canada." Meanwhile, just how and whether Australia's carbon tax will indeed unravel remains unclear. A bill will undoubtedly be put before Parliament and will pass the House, but it's the Senate that could give Abbott a run for his money. New senators do not take their seats until July, and Jackson said until then, the body is likely to rebuff attempts to repeal the tax. "I think they will have a difficult time of it," Jackson said. "They may get there in the end ... but I think at the end of the day, it's going to be difficult for them to repeal." Even when the Senate changes hands, activists note, the rise of up to eight lawmakers from "micro-parties," from the Australian Sports Party to the Australian Motor Enthusiasts Party, means Abbott will be negotiating with unknown quantities. "There's a whole lot of senators who it's anyone's guess how they will vote," Malos said. In the meantime, the opposition Labor Party is in the midst of choosing a new leader, and that person could also set the tone for how hard the party will fight to keep the carbon tax. Some voices within Labor, Malos said, already are suggesting giving up on the tax and putting forward Abbott's alternative, known as the Direct Action Plan, or even advancing legislation to fully link Australia to international carbon markets. "It could be a messy few weeks," Malos said. In the meantime, she said activists are "trying to make it clear to politicians that people in Australia do want climate action, even if they don't support the carbon tax."